The other day I went to see the new exhibition at Gawthorpe Hall about the Lancashire Witches. It will be there until the 8 July and will then be on show at Lancaster City Museum from 21 July until 29 September 2012. It’s been collated to mark the 400th anniversary of the witch trials and, as well as telling the story of the Lancashire witches, it has a number of interesting artefacts on display, including the children’s shoes found in the attic of the Aspinall Arms at Mitton and a mummified cat. 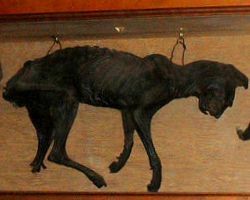 This is a mummified cat which is displayed on the wall of the Stag Inn in Hastings. The mummified cat was horribly compulsive. It was one of things you really don’t want to see but can’t stop yourself looking at. It was more or less intact, and certainly had more teeth than my own cat, but was literally just skin and bone and little more than the size of a part grown kitten. A skeleton of a cat was recently found walled up in the remains of a cottage near Barley. It was discovered by archaeologists brought in by United Utilities to survey an area near Lower Black Moss reservoir who believe that it was placed there to protect the inhabitants against evil spirits. Similar finds have been made in other places. Recently a mummified cat was found in the attic of a house in Knaresborough when it fell on a decorator. But no one is sure whether these cats were placed in walls or attics when they were dead, or whilst they were still alive. The one on display at Gawthorpe looks as if it has been posed so I really hope that it was concealed after its death as the alternative is a repugnant thought. Speaking of things which are concealed, after leaving Gawthorpe Hall I drove up through a nearby housing estate in Burnley to the top of Ightenhill Park. Here, behind the houses, are the remains of Ightenhill Manor house. Ightenhill was part of the vast lands that belonged to the de Lacy family. Henry de Lacy had used Ightenhill as a stud to breed horses, but one version of the family history says that it was from a window here, and not a turret at Pontefract Castle, that his son and heir fell to his death and that afterwards he abandoned the place. Ightenhill passed to Thomas of Lancaster, the husband of Henry’s daughter Alice de Lacy, and during his rebellion the horses were taken to Skipton. The inquiry recorded that in 1324 “there were no mares here, but a trifling head of rounceys and colts“. It was also recorded that “Nicholas Maulleverer then constable of Skipton Castle, with many others from Craven and Airedale, did take from the Equitium or Haras (the horse breeding establishment) of Ightenhill and the Instaurators (chief cow keepers) of Pendle and Trawden various animals, and did waste the King’s wine at Ightenhill to his loss, as they understand, of £232. 6d“. After the execution of Thomas of Lancaster, Ightenhill passed to the king, Edward II – Alice being forced to relinquish any claim on the land that had been in her family’s possession for generations. And although Alice and her husband, Eble le Strange, managed to recover some of her property in the reign of Edward III, the king retained Ightenhill and continued to use it as a stud farm. In 1426, the kitchen, granary and other buildings of the manor-house were thoroughly repaired at a cost of £13 3s. 6d. under the superintendence of James Banastre. Thomas Lord Stanley held the park at farm in 1459 at the rent of £20 6s. 8d., John Pilkington in 1464, and Hugh Gartside in 1474. In 1495 Sir Thomas Walton was tenant. The manor courts appear to have been held at Ightenhill until the reign of Henry VIII, when Higham was adopted. At the day of taking this inquest the great hall and the timber of the manor-house of Ightenhill are in ruins and fallen to the ground, a great part carried away and not to be found there. The great chamber at the western end of the hall is in like state; the kitchen, butler’s house, and pantry are destroyed and no part to be found, nor are any timbers or slate-stones now left. The oven-house and great barn are in like state. The long chamber at the western end of the hall has fallen down and no part of it remains. Only the park-keeper’s house remains standing, with timber and slate-stones; but the doors and windows have been taken away, and it is like to fall for lack of repair. The chapel there and the stable also remain in like state. John Towneley has not been found guilty of the removal or destruction of any timber or stone of the said houses. In 1894 the foundations of the keep could still be traced and the old draw well had only recently been covered. Today it is just a field with some bumps. 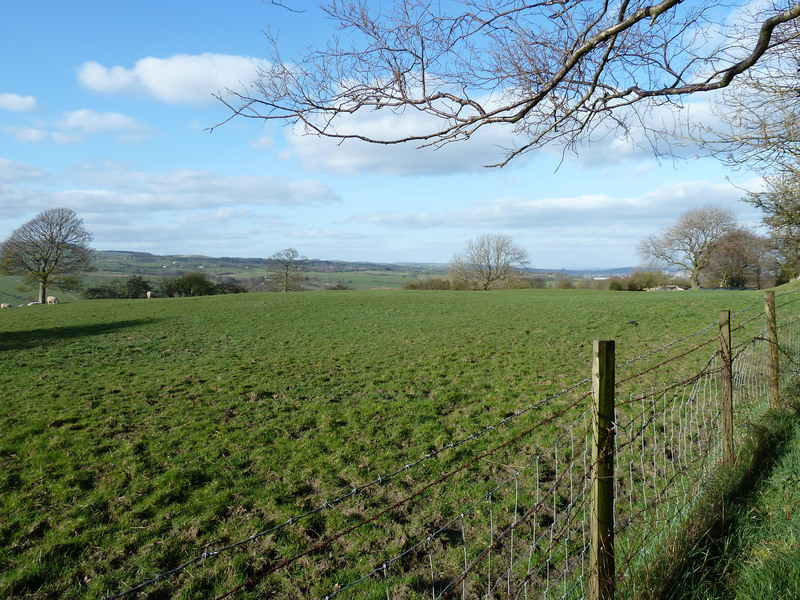 But the view is stunning and although you can’t really see it in the photograph, Pendle Hill stands on the horizon and the de Lacys would have been able to see miles and miles of their property from here. Glad you found out about Ightenhill in the end. Great descriptions of what might once have been there, from the records. Going to Gawthorpe in June to see the Pendle Witches exhibition, but not sure I want to see that cat! Interesting info about Ightenhill. I need to drag out my family history files to discover my ancestral link to the de Lacy family.